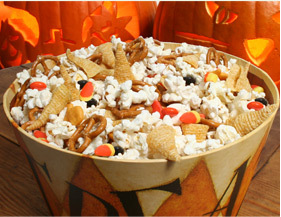 From delicious buffet-style entrees and tasty dessert treats to inventive pumpkin carving patterns, RecipeTips.com has everything you'll need to make your Halloween party a totally spook-tacular event. 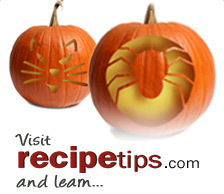 Don't forget to check out the "how to" articles for tips and advice on preparing your favorite Halloween treats. Happy Halloween! A fun appetizer for your Halloween party. Serve these yummy treats and be the first to welcome in the fall season or on Halloween and kids are sure to gobble them up. Put a smile on their face with this Halloween family night favorite. Be prepared for giggles when this "wormy" dessert is served.